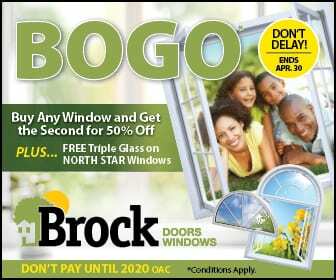 REPLACEMENT WINDOWS FOR YOUR BRAMPTON HOME WITH BROCK! Brock Doors & Windows Ltd. REPLACEMENT WINDOWS FOR YOUR BRAMPTON HOME WITH BROCK! Disappointment and dissatisfaction are usually the motivators behind upgrading features—like windows—in the home. We, humans, are fickle: we change our minds, our styles and preferences change, our needs change. That’s ok! Lucky for you, the professionals at Brock Doors & Windows in Brampton, ON, are the experts in addressing all things window related. Complaints about your old windows? Dissatisfied with the options you chose 15 years ago? Did you move into a house way overdue for window upgrades? We can help! They could be warped—which can cause a slew of issues, including a high utility bill, increased bugs sneaking into the house, safety issues because they will not close properly, etc. We have learned not to be surprised when new clients come to us claiming their windows have been difficult to open or shut for months, even years. People are people—we all can easily and mindlessly get used to inconveniences which have crept up slowly and become “normal.” That said if your windows do not open as easily as they used to, or if you find yourself having to use much of your body weight just to get your window to close—there is an issue. Your home is trying to tell you that something is not right with the frames. There may be hidden rust or rot; there could be warping which has altered the shape and track. It’s possible our team here can make repairs, but the longer you allow the window(s) to grow in inoperability, the more likely the need for replacement becomes. Further, we are obligated to remind our clients that a window with open/close issues can quickly become a window that slams itself shut. Ouch! As little as fifteen years ago this world was a very different place with regard to eco-friendliness and Earth-responsible living. These days, however, not only is living responsibly the right way to posture oneself—it is “cool” and mainstream. Window manufacturers actually compete against one another and against standards set by national companies to ensure homeowners have quality, energy-efficient replacement windows in Brampton, ON. Don’t we all? If it’s not the neighbor’s kids, it’s the planes or trains or emergency vehicles or next-door party. And to think—we all believed home ownership meant peace and quiet. It can mean that! Visit our showroom and let our professionals show you how we can temper the noise for you. What complaints do you have of your current windows? Bring them to our team here at Brock Windows and Doors!